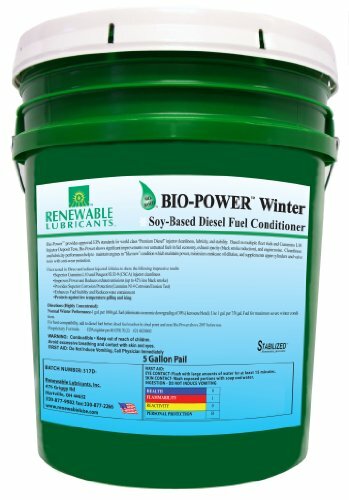 Renewable Lubricants Bio-Power is a soy-based diesel fuel conditioner formulated to improve fuel economy and power, and overcome the known problems associated with today's fuel and newer emission control systems. Bio-Power provides approved EPA standards for world class "Premium Diesel" injector cleanliness, lubricity, and stability (EPA registration #214820002 per 40 CFR 70.23). When used at the recommended treat rate in untreated fuel, Bio- Power helps diesel fuels meet and exceed the National Conference on Weights and Measurements (NCWM), Engine Manufacturer's Association (EMA) and Truck Maintenance Council (TMC) requirements for: Cummins L10 Injector Depositing Test Detergency (Reference SAE Paper No. 912331). Fuel Stability using the 180 minute, 302 degree F oxidation test (NCWM and ASTM accepted). Improved Lubricity (ASTM D-6078 Scuffing/Load BOCLE). Corrosion Protection ASTM D-665A (NACE). Water Tolerance ASTM D-1094. Based on multiple fleet trials and Cummins L10 Injector Deposit Tests, Bio-Power shows significant improvements over untreated fuels in fuel economy, exhaust opacity (black smoke reduction), and engine noise. Cleanliness and lubricity performance help to maintain engines in "like new" condition which maintains power, minimizes crankcase oil dilution, and supplements upper cylinders and valve train with anti-wear protection. For: Railway, Marine, Stationary Equipment, Transportation, and Passenger Vehicle Diesel Engines Fleet tested in Direct and Indirect Injection Vehicles to show the following impressive results: Provides superior rating level of injector cleanliness as shown by the Cummins L10 test. Exceeds CSCA requirements for Peugeot XUD-9 injector cleanliness. Improves fuel economy (4.1 percent to 13.6 percent) and horsepower (up to 5.6 percent). Reduces exhaust emissions (up to 42 percent less black smoke) and reduces NOx. Provides superior corrosion protection (Cummins N14 Corrosion/Erosion Test).